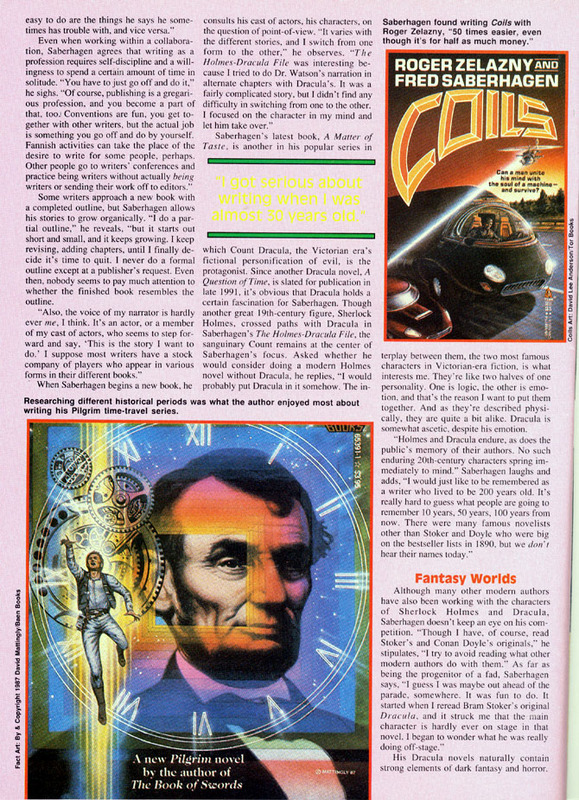 This article appeared in the October 1991 issue of Starlog magazine (#171) and is reprinted here exclusively, with express permission from Starlog. Starlog's website may be found here. The page whereback issues and subscriptions can be purchased may be found here. You can either see images of the original pages (click thumbnails for larger image), or read the entire text below. 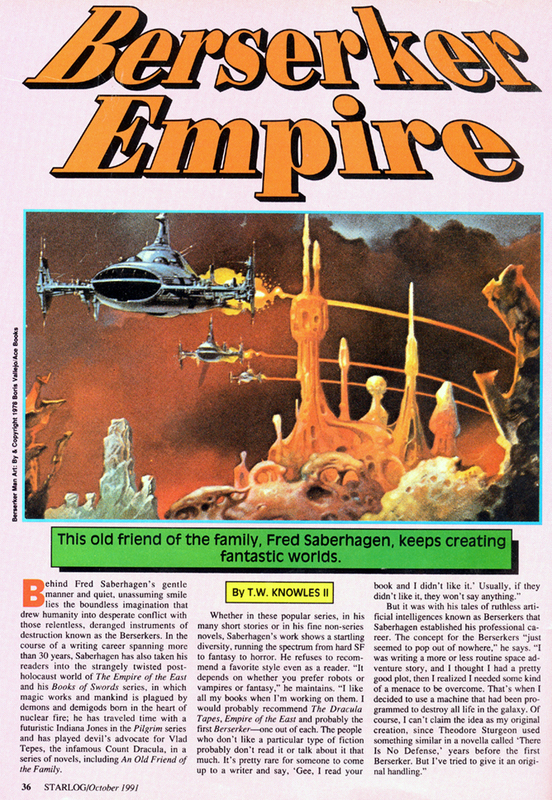 This old friend of the family, Fred Saberhagen, keeps creating fantastic worlds. Behind Fred Saberhagen's gentle manner and quiet, unassuming smile lies the boundless imagination that drew humanity into desperate conflict with those relentless, deranged instruments of destruction known as the Berserkers. In the course of a writing career spanning more than 30 years, Saberhagen has also taken his readers into the strangely twisted post-holocaust world of The Empire of the East and his Books of Swords series, in which magic works and mankind is plagued by demons and demigods born in the heart of nuclear fire; he has traveled time with a futuristic Indiana Jones in the Pilgrim series and has played devil's advocate for Vlad Tepes, the infamous Count Dracula, in a series of novels, including An Old Friend of the Family. Whether in these popular series, in his many short stories or in his fine non-series novels, Saberhagen's work shows a startling diversity, running the spectrum from hard SF to fantasy to horror. He refuses to recommend a favorite style even as a reader. "It depends on whether you prefer robots or vampires or fantasy," he maintains. "I like all my books when I'm working on them. I would probably recommend The Dracula Tapes, Empire of the East and probably the first Berserker - one out of each. The people who don't like a particular type of fiction probably don't read it or talk about it that much. It's pretty rare for someone to come up to a writer and say, 'Gee, I read your book and I didn't like it.' Usually, if they didn't like it, they won't say anything." But it was with his tales of ruthless artificial intelligences known as Berserkers that Saberhagen established his professional career. The concept for the Berserkers "just seemed to pop out of nowhere," he says. "I was writing a more or less routine space ad-venture story, and I thought I had a pretty good plot, then I realized I needed some kind of a menace to be overcome. That's when I decided to use a machine that had been pro-grammed to destroy all life in the galaxy. Of course, I can't claim the idea as my original creation, since Theodore Sturgeon used something similar in a novella called 'There Is No Defense,' years before the first Berserker. But I've tried to give it an original handling." The concept behind his Berserker books “just seemed to pop out of nowhere,” the writer admits. one of the evil wizards." Saberhagen was attracted to SF and fan-tasy when he was a child. "The first SF story I read-I was eight or nine years old--scared the living daylights out of me. It had something to do with alien spores drifting down to Earth and growing up into horren-dous monsters. I don't remember the author or the title now, but it had an effect on me. My parents forbade me to bring any more of that stuff into the house. I think they were really worried! As I grew older, I began to suspect I could probably do it just as well as some of the people whose works I had read. It turned out that I could. "The first SF story I read scared the living daylights out of me." "A few years later, as a teenager, I started reading Analog and became a more or less conventional reader," he goes on. "I was never really a fan, like the people who organize clubs and hold conventions. I never really knew that fans existed until I had sold a story and started going to conventions. I spent four years in the U.S. Air Force after finishing high school, and I went to college for about a year after I got out of the Air Force, but that was my total of higher education. I worked as an electronics technician in the Air Force and afterward. The familiarity with technical jargon and hardware I gained in that work was an asset for writing SF." He also found his nonfiction editing experience of value in his research for his fic-tion work. "When I got married, I really needed a steady job, so I went to work as a writer and editor for Encyclopedia Britannica. That helped develop my research skills, and I also learned to be concise while still saying what I wanted to say. I edited and wrote a lot of the short articles on science and technology that you see in the Micropedia, the volumes where you start to look things up for using in the modern Britannica. That may be why the Pilgrim time-travel series was quite a lot of fun. I like to go back and do historical research on certain eras." Author Fred Saberhagen likes giving his readers "a real story, with a beginning, a middle and an end." 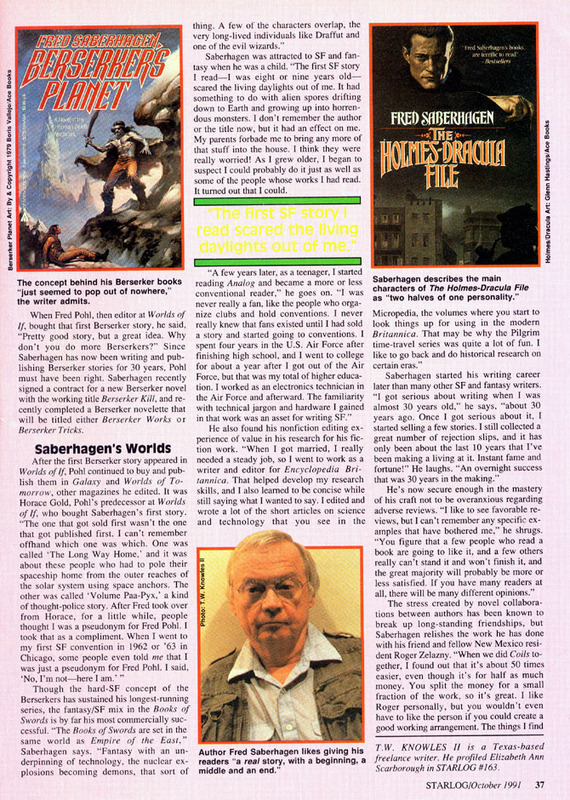 Saberhagen started his writing career later than many other SF and fantasy writers. "I got serious about writing when I was almost 30 years old," he says, "about 30 years ago. Once I got serious about it, I started selling a few stories. I still collected a great number of rejection slips, and it has only been about the last 10 years that I've been making a living at it. Instant fame and fortune!" He laughs. "An overnight success that was 30 years in the making." He's now secure enough in the mastery of his craft not to be overanxious regarding adverse reviews. "I like to see favorable reviews, but I can't remember any specific examples that have bothered me," he shrugs. "You figure that a few people who read a book are going to like it, and a few others really can't stand it and won't finish it, and the great majority will probably be more or less satisfied. If you have many readers at all, there will be many different opinions." The stress created by novel collaborations between authors has been known to break up long-standing friendships, but Saherhagen relishes the work he has done with his friend and fellow New Mexico resident Roger Zelazny. "When we did Coils together, I found out that it's about 50 times easier, even though it's for half as much money. You split the money for a small fraction of the work, so it's great. I like Roger personally, but you wouldn't even have to like the person if you could create a good working arrangement. The things I find easy to do are the things he says he sometimes has trouble with, and vice versa." Even when working within a collaboration, Saberhagen agrees that writing as a profession requires self-discipline and a will-ingness to spend a certain amount of time in solitude. "You have to just go off and do it," he sighs. "Of course, publishing is a gregari-ous profession, and you become a part of that, too. Conventions are fun, you get together with other writers, but the actual job is something you go off and do by yourself. Fannish activities can take the place of the desire to write for some people, perhaps. Other people go to writers' conferences and practice being writers without actually being writers or sending their work off to editors." "I got serious about writing when I was almost 30 years old." Some writers approach a new book with a completed outline, but Saberhagen allows his stories to grow organically. ''I do a par-tial outline," he reveals, "but it starts out short and small, and it keeps growing. I keep revising, adding chapters, until I finally de-cide it's time to quit. I never do a formal outline except at a publisher's request. Even then, nobody seems to pay much attention to whether the finished book resembles the outline. ward and say, 'This is the story I ware to do.' I suppose most writers have a stock company of players who appear in various forms in their different books." When Saherhagen begins a new book, he consults his cast of actors, his characters, on the question of point-of-view . "It varies with the different stories, and I switch from one form to the other," he observes. "The Holmes-Drarula File was interesting be-cause I tried to do Dr. Watson's narration in alternate chapters with Dracula's. It was a fairly complicated story, but I didn't find any difficulty in switching from one to the other. I focused on the character in my mind and let him take over." Even as a child, Saberhagen knew he could write alien and monster stories just as entertaining as the ones he had read. Holmes, crossed paths with Dracula in Saherhagen's The Holmes Dracula File, the sanguinary Count remains at the center of Saherhagen's focus. Asked whether he would consider doing a modern Holmes novel without Dracula, he replies, '' I would probably put Dracula in it somehow. The interplay between them, the two most famous characters in Victorian-era fiction, is what interests me. They're like two halves of one personality. One is logic, the other is emotion, and that's the reason I want to put themtogether. And as they're described physically, they are quite a bit alike. Dracula is somewhat ascetic, despite his emotion.
" Holmes and Dracula endure, as does the public's memory of their authors. No such enduring 20th-century characters spring immediately to mind." Saherhagen laughs and adds, "I would just like to he remembered as a writer who lived to he 200 years old. It's really hard to guess what people are going to remember 10 years, 50 years, 100 years from now. There were many famous novelists other than Stoker and Doyle who were big on the bestseller lists in 1890, but we don't hear their names today." Although many other modern authors have also been working with the characters of Sherlock Holmes and Dracula, Saherhagen doesn't keep an eye on his competition. "Though I have, of course, read Stoker's and Conan Doyle's originals,'' he stipulates, "I try to avoid reading what other modern authors do with them." As far as being the progenitor of a fad, Saberhagen says. ''I guess I was maybe out ahead of the parade, somewhere. It was fun to do. It started when I reread Brain Stoker's original Dracula, and it struck me that the main character is hardly ever on stage in that novel. I began to wonder what he was really doing off-stage." "Not to do a whole story is to wrong the reader." elements of Arthurian legend to produce a chilling modern tale of the macabre. Not only was Dominion his darkest hook, but also the most difficult to write. ''I was never really happy with that hook,'' he say's with a frown, "I kept tinkering with it, kept changing things around. I finally felt it was all right, hot it's not one of my favorites. Not a fun book to write." 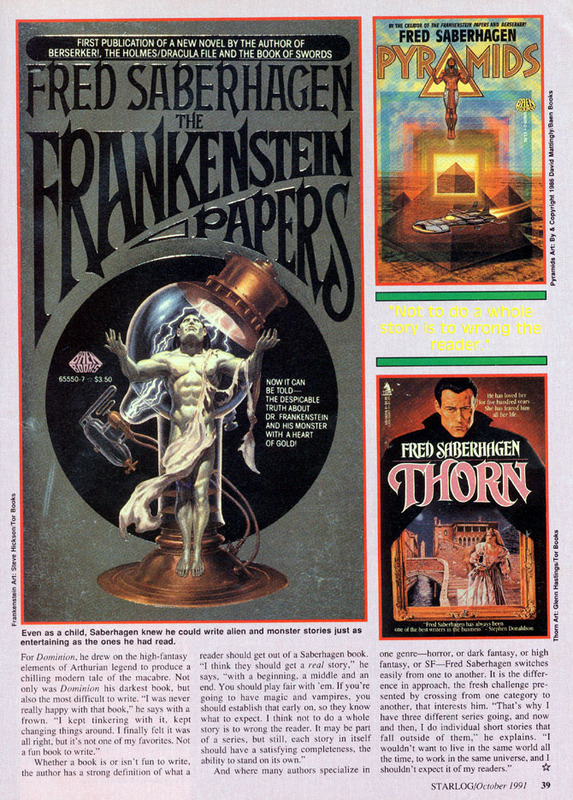 And where many authors specialize in one genre - horror, or dark fantasy, or high fantasy, or SF - Fred Saherhagen switches easily from one to another. It is the difference in approach, the fresh challenge presented by crossing from one category to another, that interests him. "That's why I have three different series going, and now and then, I do individual short stories that fall outside of them," he explains. "I wouldn't want to live in the same world all the time, to work in the same universe, and I shouldn't expect it of my readers." T.W. KNOWLES II is a Texas-based freelance writer. He profiled Elizabeth Ann Scarborough in STARLOG #163.